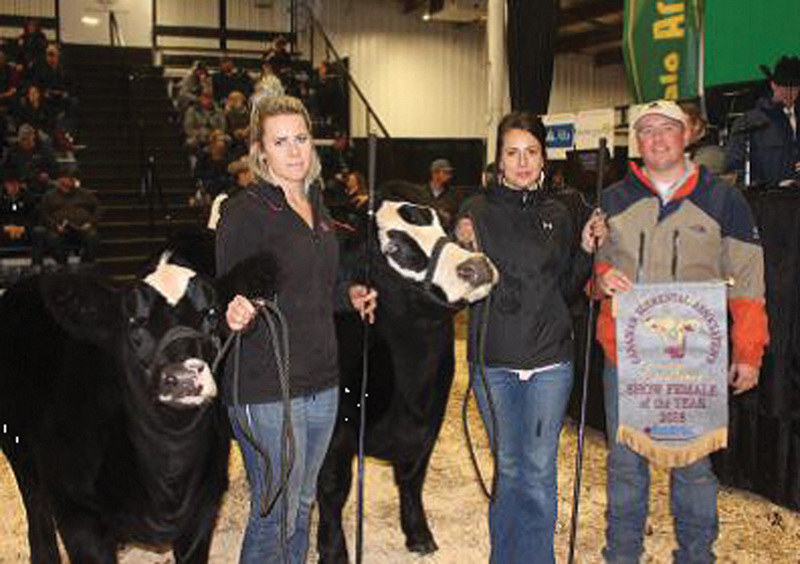 At Canadian Western Agribition, the Saskatchewan Simmental Association recognized their Commercial and Purebred Breeders of the Year. 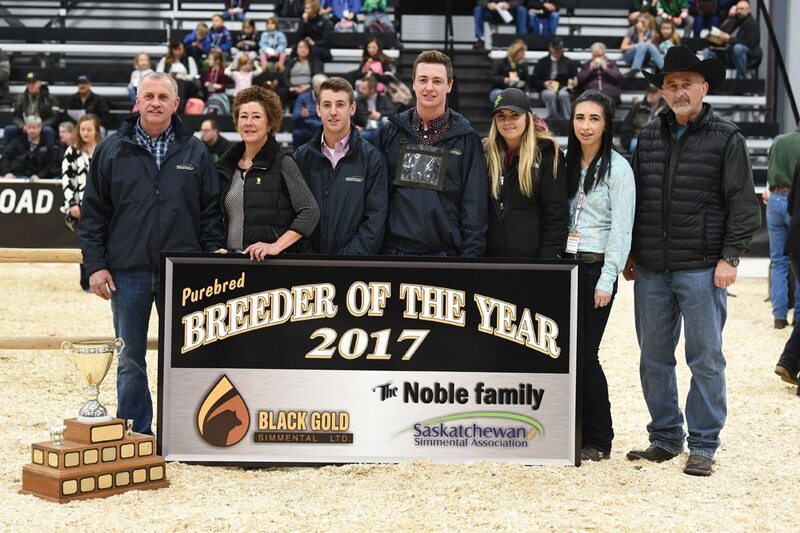 Black Gold Simmental made up of the Noble family, Randy and Vanessa Noble and sons Ryley and Toby, was awarded the 2017 Purebred Breeder of the Year and Andy Hofer from Spring Creek Colony, 2017 Commercial Breeder of the Year. 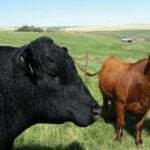 Black Gold Simmental is a family farm operated by the Noble families in the Hillmond area northeast of Lloydminster. 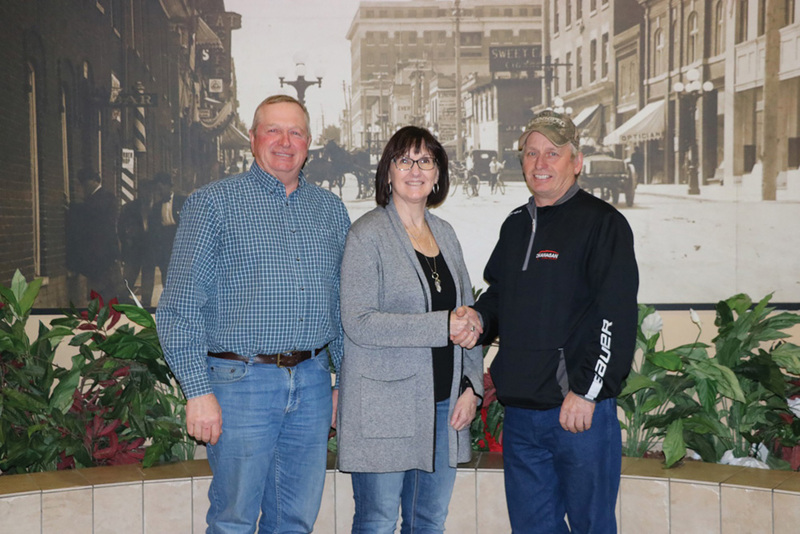 It was established in 1973 when Randy’s parents Jim and Sabra Noble purchased two 1/2 blood heifers from the Agribition sale which was the start of the purebred herd. 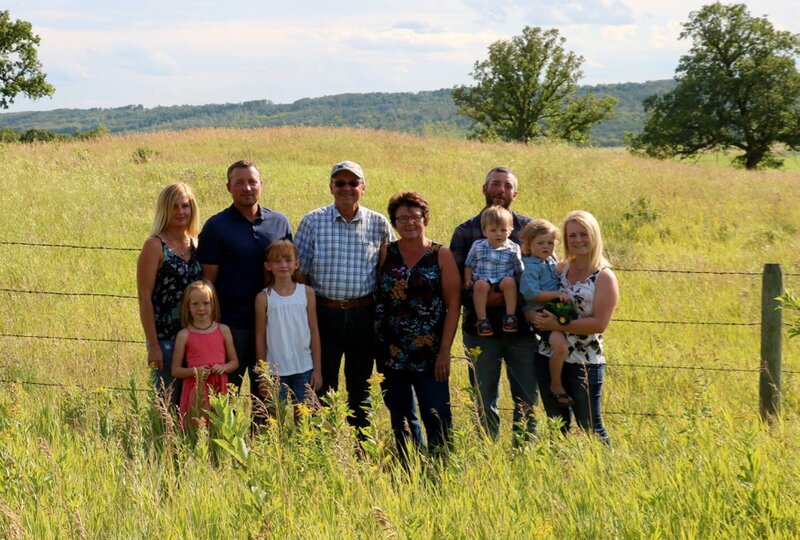 The four sons Randy, Lyle, Owen and Neil worked with their parents to grow the herd to 180 fullblood red and black Simmental cows and 70 commercial cows. 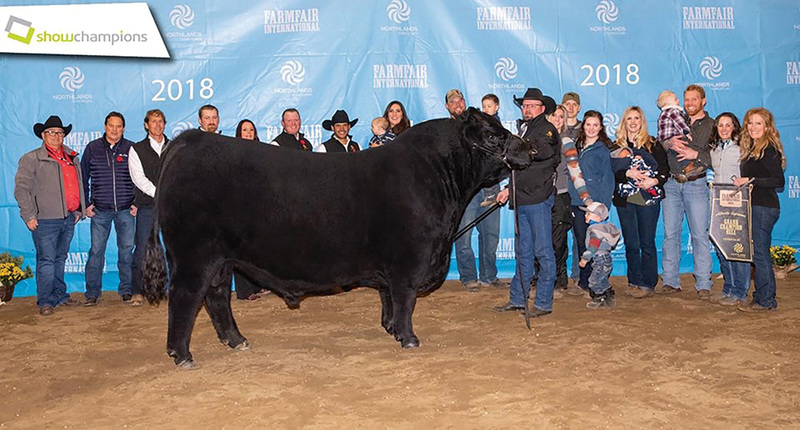 Five years ago, along with Red Willow Ranch and Little Willow Creek Ranch, they esablished the Next Generation annual bull and female sale in Lloydminster to market Simmental genetics to a larger audience. 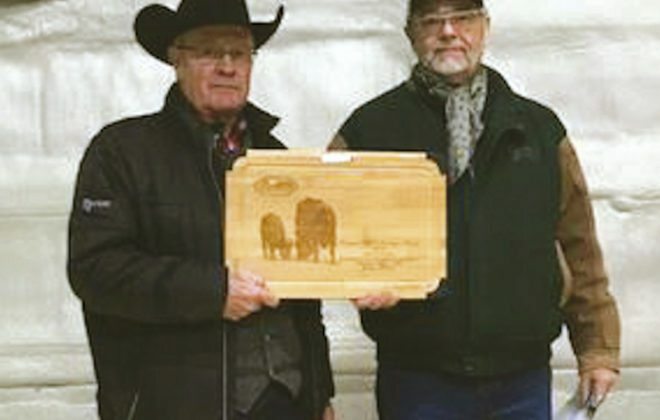 Noble contributed their success to many mentors over the years including the Harlands of Little Willow Creek Ranch, Stanley Palmer, who was a partner in many sales, and the Mapletoft family of Little Pipestone Ranch. 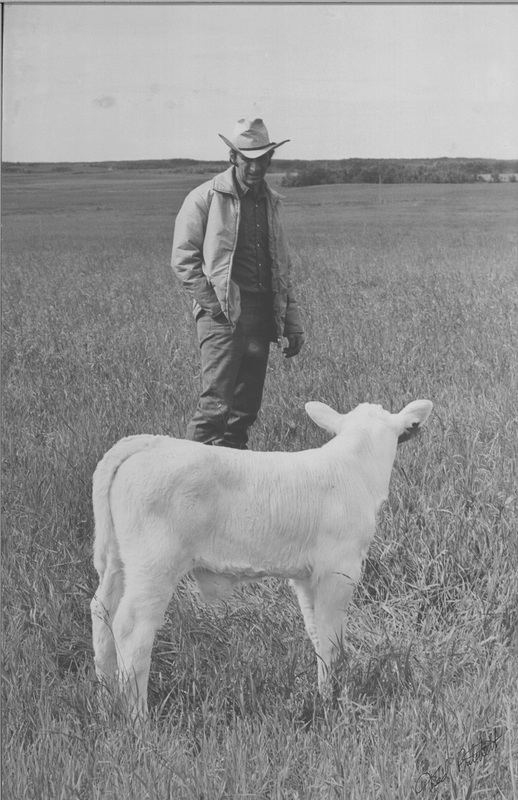 In the early years the boys showed cattle with Frank Mapletoft and learned about selecting good cattle, and having fun.Noble is encouraged by the number of young people today who are interested in cattle and the Simmental breed. Andy Hofer from Spring Creek Colony is a promoter of Simmental cattle. The colony gets its mail at Walsh, Alta., but is located in Saskatchewan, west of Maple Creek. Originally established in 1956, Spring Creek’s cow herd has grown to 900 females with 150 heifers being bred every year. Hofer took over as cow boss in 1995 and immediately started to integrate Simmental genetics into the herd to decrease cow size while at the same time increase weaning weights. 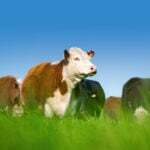 Heifers are bred Red Angus to calve in March and cows bred Simmental to calve in April and May. 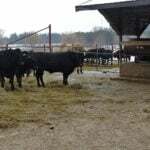 The breed’s maternal traits worked well in their herd but Hofer says the real payday has been in the 1,000-head feedlot, where the colony finishes their own cattle. 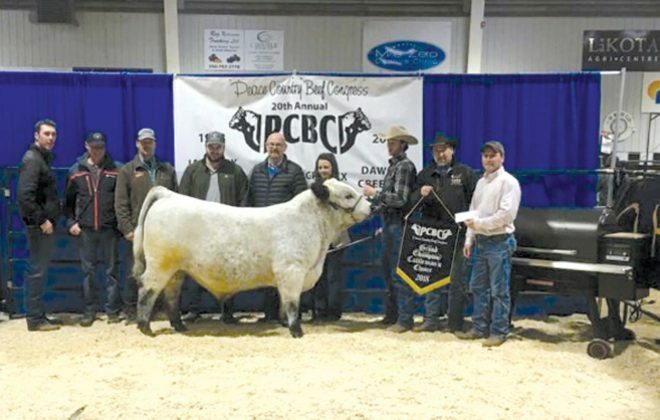 Spring Creek Colony has won the prestigious Medicine Hat commercial show and numerous first place honours in the open heifer calf competition. In 2008 it was recognized as Commerical Breeder of the Year by the Canadian Red Angus Promotion Society. 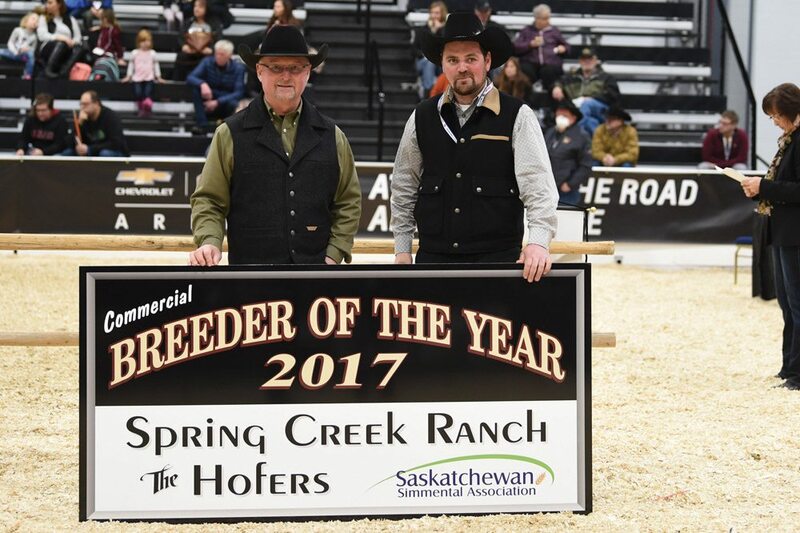 2017 Saskatchewan Simmental Association Purebred Breeder of the Year. 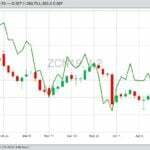 The Canadian Hereford Association launched new EPD in December 2017 based on a new system of analysis called “BOLT” Single Step technology, which is the most accurate calculation possible. It reduces the time it takes to complete an EPD run, better incorporates genomic data and will calculate real accuracies. This changes keeps the CHA in line with the AHA. BOLT incorporates genomics into the evaluation in a more correct fashion. BOLT separates traits. In the past, other traits had influence over the trait of interest through correlations, but now individual traits have been separated to allow for better selection on the trait of interest. BOLT calculates accuracy differently. In the past, our genetic models could only estimate accuracy, this was the best tool at the time, however with BOLT accuracy can be calculated, not estimated. Largest changes you will notice are in calving ease and maternal CE. This is due to two things: More calving observations are being used. In the past if a calf crop was all scored as unassisted, the data could not be used in the evaluation, because the evaluation needed variation to determine a deviation from average. BOLT uses a different method that uses all data, even data that is uniform across a calf crop. Accuracies have seen a more significant change as in the case of older, currently unused bulls. Some (and possibly all) of their progeny records have been removed from the analysis due to the data cutoff; however, the change in accuracy on a population basis has been quite small. Check out the Canadian Hereford website for more information. 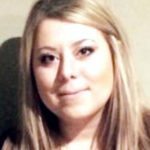 Carley Henniger originated from the West Kootenay region in British Columbia, and moved to Edmonton to attend the University of Alberta to complete a double major in political science and international relations. 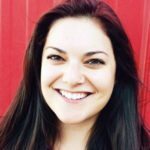 She does not have a farm background but during her time in Alberta she decided to pursue a career in agriculture. 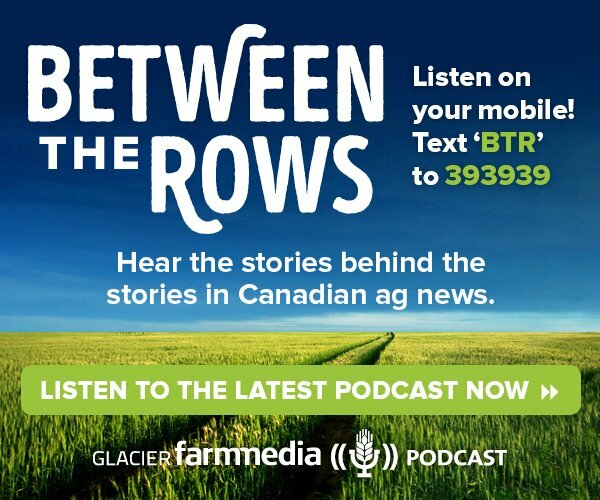 After graduation she moved just outside of Calgary to work as a farm hand for a large mixed grain and feedlot operation, eventually moving up to a position on the business side of the operation. She also became a junior board member for the 4-H communications board. From there she headed home to B.C. to work for Douglas Lake Cattle Company, and recently completed the rural finance and entrepreneurship program at Olds College. She currently lives in Kamloops, working for the B.C. Angus Association, volunteers with 4H B.C. and is in the beginning stages of becoming a first-generation cattle rancher. Carley may not have grown up on a farm, but she sure got there as soon as she could. Lee Creech was born and raised on a ranch just north of Lloydminster, Alta., and grew up spending his summers building fences and calving cows. His family’s ranch, M.C. Quantock, has grown in size significantly over the years, currently calving around 1,000 cows. The herd is predominantly purebred Red Angus and Angus with a couple hundred Hereford and Charolais cows. These cows produce the bulls that go into their annual M.C. 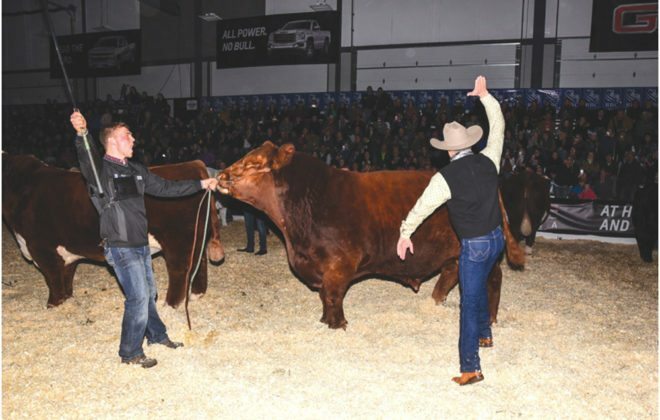 Quantock “Canada’s Bulls” Bull Sale on the final Saturday in January. After graduating high school in Lloydminster, he attended the University of Lethbridge, Alta. graduating with a bachelor of management in marketing. Upon graduation, he moved to the ranch and started working various assignments on the business side of the ranch. 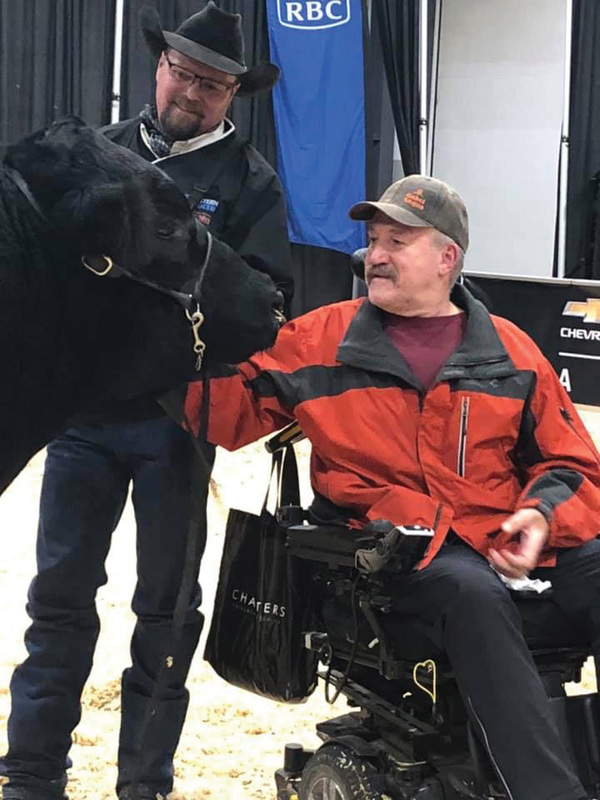 To diversify his skill set he then accepted a job in Wetaskiwin, working with two ruminant nutritionists testing forages, balancing rations, and making recommendations for hundreds of cow/calf producers, seed stock operations, and backgrounding feedlots. Next he opened his own business importing utility vehicles from overseas and completed the World Wide College of Auctioneering course in Denver. 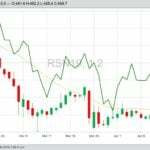 That led into a job with Global Auction Guide, a technology company that helps auction markets and auction houses market their sales online. 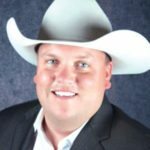 After some ranch succession planning timelines were established back home, he decide to pursue a master’s of science degree in ranch management at the King Ranch Institute for Ranch Management at Texas A&M University-Kingsville. The institute admits only three new students per year. Creech was awarded the Joe Marlin Hilliard Endowed Fellowship, as well as the unique honour of being the first-ever international student. Kaitlyn is currently an inspector with the Canadian Food Inspection Agency, and she and her fiancé Mark are ranching alongside her parents Allan and Juanita. Kaitlyn volunteers with her local 4-H club and plans to do more volunteer work while helping Mark and her family expand the family ranch. 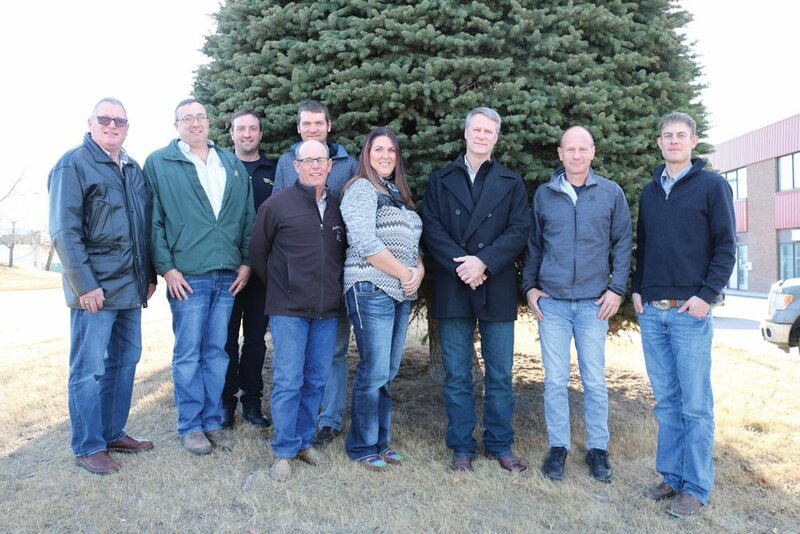 The 2017-18 Canadian Limousin Association board of directors was elected in July and had their winter board meeting in Calgary in December (l to r): Bill Zwambag (treasurer), Ont. ; Mike Geddes, Ont. ; Matthew Heleniak, Ont. ; Cody Miller, Alta. ; Tim Andrew, Alta. ; Erin Kishkan (president), B.C. ; Terry Hepper (past president), Sask. ; Joe Cooper, N.S. ; Eric Boon (vice-president), Sask. Missing: Dan Darling, Ont.